You eat healthy, drink plenty of water and try to get outside to exercise a few times a week. What about your foot health? Let's face it, we are all on our feet a good portion of the day. If you are not wearing "healthy" shoes, then your body is suffering. Strive's Biomechanical Footbed Technology™ matches the unique contours of your feet to help improve posture and reduce harmful stresses. Incorporate the Montauk into your spring and summer wardrobe for whole body health. 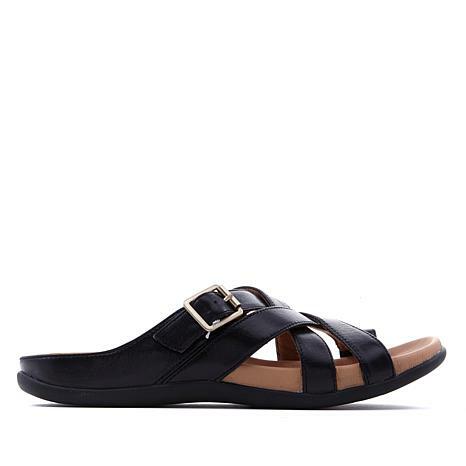 I love the style of this shoe and the footbed is extremely comfortable. Lots of support in the right places. My one complaint is the silver metallic is actually more of a soft gold. Sizing seems to be ok. I'm a 7.5 if you're an 8 I would go up to 8.5/9. I just received my 8/9. It fits very tight and narrow (just as another review stated). It presses on my bunions. I want to love it because it is a very well made shoe. I will wear them around the house a bit and see if they stretch. I wish HSN would show the "tops" of shoes...? For quality I give it 4 stars. I was excited to receive this sandal. Once it was delivered, I knew right out of the box that the sizing wouldn't work for me. 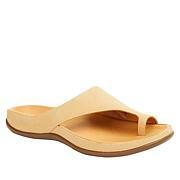 I am ALWAYS a size 8 (medium) in any sandal, however, the 7 1/2-8 sizing is too small, too tight, and too narrow.. The shoe seems to be constructed nicely, so, I reordered choosing the 8 1/2 -9. I'll let you know if it works any better. This manufacturer needs to rethink the combined sizes and size in individual numbers.